Dave is being honored for his devotion to EMS and his community, day in and day out. His peers and colleagues nominated him, saying out that his dedication has made an incredible difference in all the lives he has touched and that his humanitarian values reach far beyond what is professionally expected. 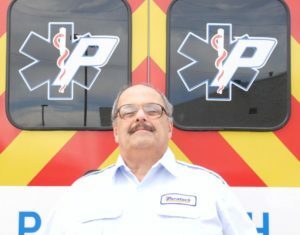 He has worked with Paratech Ambulance for almost 25 years and has been involved with EMS since 1972. Dave’s worn many different hats during this time: He’s served as an EMT, CPR instructor, Ambulance Operations manager, dispatcher, and finally as the supervisor in our Communications Center. Dave’s desire to help others does not stop with EMS, though. He and his wife Ginny have opened their home and their hearts to 19 foster children over the past 14 years, some of those children with significant special needs. In Dave’s ongoing quest to find a way to help other foster children, he has organized a group to promote and support those involved in foster care. He loves being a foster father and was delighted to become an adoptive parent. Dave enjoys hiking with his family and sports. He is deeply involved with his church and leads a group for people who want to become involved in foster care. We want to honor Dave for making an incredible difference in all our lives.